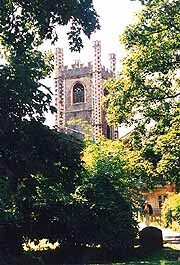 St. Laurence's Church was erected alongside the Abbey Church of Reading to serve the people of the eastern part of the town. It was bounded by the main Compter (or Prison) Gate to the south and the Hospitium of St. John to the north. The private chapel of the latter institution stood in its north aisle. Since the Abbey stimulated trade in the town, St. Laurence's soon became engulfed in a large market place with stocks and a pillory. It is still known as the Butter Market. The church was extensively rebuilt in 1196 and again in the fifteenth century. It houses much of interest inside: A font made by a master-mason from Hampton Court Palace in 1522 and used for the christening of Archbishop Laud fifty years later; a number of interesting brasses including a palimpsest (reused) originally from Charterhouse in London; 15th century carved choir-stalls; the Mayor's pew; a remnant of the pre-reformation altar showing the Adoration of the Magi; the 16th century parish chest; and a fascinating monument to John Blagrave, a famous 17th century mathematician, showing allegorical figures of geometric shapes.